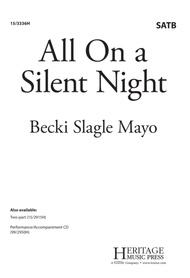 Composed by Becki Slagle Mayo. Performance/accompaniment CD. Christmas. Octavo. 12 pages. Heritage Music Press #15/3336H. Published by Heritage Music Press (LX.15-3336H). This beautiful arrangement pairs Silent Night with an original melody, lending a delightful ambiance to this beloved classic. The flowing piano and cello accompaniments enhance the lyrical melodies and rich harmonies. Very accessible for developing choirs, this selection is sure to be a holiday favorite perfect for school and church settings.